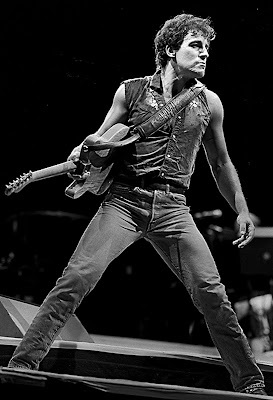 In the late eighties Bruce Springsteen was at his apex and touring the country doing large arena shows. One of these shows was at the Oakland Coliseum, where the Oakland A’s play baseball and where the Oakland Raiders didn’t play football, having recently moved to LA. Shooting rock and roll can be fun, but after a few years it can be a grind. There are a lot of restrictions put on photographers. To shoot most rock shows photographers need to pick up a special pass and be escorted into a backstage holding area. Sometimes the promoter will make you sign a waiver that restricts what you can do with the photos, except with the permission of the musician (promoters call them the artist, people who make art are artists, people who make music are musicians). A few minutes before the concert starts, security escorts you to a pit in front of the stage. It’s a good place to shoot, but you are usually looking up the band’s nose. You get to shoot the first three songs only. Sometimes it’s the second three, or just two, but the general rule is the first three. Most of the first song is spent figuring out the lighting. The second two songs you shoot like crazy and hope something interesting happens on stage. I use two cameras, one with a wide-angle lens, one with a mid-range telephoto, you never know where something is going to happen. By the third song, panic has died down and you can concentrate on getting a picture. But once that third song is over, security is literally shoving you out the back door, never to be allowed to return. The time came to be escorted into the back stage area for the Springsteen concert. Waiting with the other photographers, is always an experience. There are lots of hoops to jump through to shoot a large concert; like showing press passes, your name being checked against a long list of people, and getting searched. But there are always people back there that obviously aren’t real photographers. They have cheap, Instamatic-type cameras. They must be friends of the promoter or won some kind of radio station contest to be there. This time it seemed like there were more than the usual number of them, and if just one does something stupid, we could all get thrown out. The lights came down and it was time to be escorted into the pit. We were all herded from our holding area around the huge stage to the front. But the pit wasn’t the usual space between a four-foot barrier and an eight-foot-high stage, it was right next to a series of multi-level platforms, the lowest point being two feet high and right in front of us. I felt like I was going to be part of the show. I fidgeted with both of my cameras, trying to figure out where Springsteen would be when he came on stage. The lights came sharply up to a blindingly bright level, and the E Street Band started playing. Bruce came on stage from the right, singing and jumping down from level to level until he was right in front of the photographers. I had made the assumption that Springsteen would be a distance from us, at least at first, so I was holding the camera with the telephoto lens. When he jumped down to within a few feet of me I had to change cameras to the one with the wide-angle. As Bruce jumped down to the last and lowest level, he stumbled very slightly at about the time I was looking down, reaching for my other camera. When he stumbled, the trademark red bandana he was wearing on his head came flying off and landed at my feet. Oddly enough the other photographers didn’t notice this. I looked at the bandana at my feet, and then up at Bruce, he was staring straight at me, and then back down at his bandana. I didn’t know what to do, reach down and give it back? No way; it would screw up his song, and possibly sic security on me. Should I just ignore it? An iconic piece of cloth was lying at my feet; would I leave the Shroud of Turin lying there? Should I pick it up and give it to the security people to give back to Springsteen? I’m sure Bruce has dozens of these, and besides the security guy would probably just keep it. The answer was to pick it up while no one was looking and put it into my camera bag, I’d figure out what to do with it later, after all it’s just a bandana. As I reached down, making sure none of the security people or photographers saw me do it, I was spotted by two people: Bruce himself, and a female concertgoer standing behind me. The concertgoer tapped me on the shoulder and held out her hand, expecting me to give her the precious artifact. I just ignored her, pretending the music was too loud to hear. Springsteen just looked down and shook his head and turned back upstage, knowing that he had just lost another bandana. I shoved the Bandana of Asbury Park, as I was later to call it, into the bottom my bag. I shot my three songs and was whisked out by the security people, the whole time expecting a tap on the shoulder. But I made it outside with The Bandana, no one the wiser. From that point on, and I take no credit for this, Springsteen stopped wearing a bandana.